One of the Songs of Ascents, Psalm 122 appears in Hebrew on the walls at the entrance to the City of David, Jerusalem, Israel. Song of Ascents is a title given to fifteen of the Psalms, 120–134 (119–133 in the Septuagint and the Vulgate), each starting with the superscription Shir Hama'aloth (Hebrew: שִׁיר המַעֲלוֹת‎, meaning "Song of the Ascents"). They are also variously called Gradual Psalms, Songs of Degrees, Songs of Steps or Pilgrim Songs. Four of them (Psalms 122, 124, 131, and 133) are linked in their ascriptions to David, and one (127) to Solomon. Three of them (Psalms 131, 133, and 134) have only three verses. The longest is psalm 132 (18 verses). Many scholars believe the title indicates that these psalms were sung by worshippers as they ascended the road to Jerusalem to attend the three pilgrim festivals  (Deuteronomy 16:16). Others think they were sung by the Levite singers as they ascended the fifteen steps to minister at the Temple in Jerusalem. One view says the Levites first sang the Songs at the dedication of Solomon's temple during the night of the fifteenth of Tishri 959 BC. Another study suggests that they were composed for a celebration after Nehemiah's rebuilding of Jerusalem's walls in 445 BC. Others consider that they may originally have been individual poems which were later collected together and given the title linking them to pilgrimage after the Babylonian captivity. They were well suited for being sung by their poetic form and the sentiments they express. "They are characterized by brevity, by a key-word, by epanaphora [i.e., repetition], and by their epigrammatic style.... More than half of them are cheerful, and all of them hopeful." As a collection, they contain a number of repeated formulaic phrases, as well as an emphasis on Zion. There are two references to the Songs of Ascents in the Mishnah, noting the correspondence between the fifteen songs and the temple's fifteen steps between the Israelite's court and the women's court. Rashi refers to a Talmudic legend that King David composed or sang the fifteen songs to calm rising waters at the foundation of the temple. Psalm 126, eponymously called "Shir Hamaalot" due to its common use, is traditionally recited before the Grace After Meals on Shabbat, Jewish holidays, and other festive occasions in keeping with its themes of joy and redemption. The psalm is sung to a wide variety of tunes both liturgical and secular. The most well-known melody in the Ashkenazi Jewish world is that by Cantor Pinchas Minkowsky which was recorded by Cantor Yossle Rosenblatt. It is traditional for some Jews to place a copy of Psalm 121 in the labor and delivery room to promote an easy labor by asking God for mercy. As well, it is placed on the baby's carriage and in the baby's room to protect the child and surround them in learning and with holy objects. The liturgical use of these psalms came into Christianity through its Jewish roots. The form of the Scriptures used in the Early Church, at least so far as the Hebrew Bible was concerned, was primarily the Septuagint. In the Septuagint, these psalms are numbered 119–133. Many early hermits observed the practice of reciting the entire Psalter daily, coenobitic communities would chant the entire Psalter through in a week, so these psalms would be said on a regular basis, during the course of the Canonical hours. In the Eastern Orthodox Church and those Eastern Catholic Churches which follow the Byzantine Rite, the Songs of Degrees (Greek: anabathmoi) make up the Eighteenth Kathisma (division of the Psalter), and are read on Friday evenings at Vespers throughout the liturgical year. The Kathisma is divided into three sections (called stases) of five psalms each. During Great Lent the Eighteenth Kathisma is read every weekday (Monday through Friday evening) at Vespers, and on Monday through Wednesday of Holy Week. In the Slavic usage this Kathisma is also read from the apodosis of the Exaltation of the Cross up to the forefeast of the Nativity of Christ, and from the apodosis of Theophany up to the Sunday of the Prodigal Son. The reason for this is that the nights are longer in winter, especially in the northern latitudes, so during this season three Kathismata will be chanted at Matins instead of two, so in order to still have a reading from the Psalter at Vespers, the Eighteenth Kathisma is repeated. At Matins on Sundays and feast days throughout the year, special hymns called anabathmoi (Greek: άναβαθμοί, from βαθμός, 'step'; Slavonic: stepénnyi) are chanted immediately before the prokeimenon and Matins Gospel. These anabathmoi are compositions based upon the Songs of Ascents, and are written in the eight tones of Byzantine chant. The Anabathmoi for each tone consists of three stases or sets of verses (sometimes called antiphons), except for Tone 8 which has four stases. On Sundays, the anabathmoi are chanted according to the tone of the week; on feast days which do not fall on Sunday, the Anabathmoi almost always consist of the first stasis in Tone 4 (based on Psalm 128). Symbolically, the anabathmoi are chanted as a reminder that Christians are ascending to the Heavenly Jerusalem, and that the spiritual intensity of the service is rising as they approach the reading of the Gospel. Psalms 120-127 and 129-131 are scheduled throughout the four-week Psalter for use at Vespers; 119, 128, and 132 are scheduled for use for Daytime Prayer, and 133 is scheduled for Night Prayer. Psalms 119-127 are broken into three parts, to be used as the complementary Psalmody for those who pray three daytime offices separately as Terce, Sext, and None, rather than one office of Daytime Prayer. They are used as the sole Psalmody at daytime prayer on solemnities, except for certain solemnities of the Lord and during the octave of Easter and those solemnities falling on Sunday. ^ Samet, Rav Elchanan (2018). "Shiur #08: Psalm 117 - 'O Praise The Lord, All You Nations' The Shortest Psalm in the Book of Tehillim". Yeshivat Har Etzion. Retrieved September 16, 2018. ^ a b Hossfeld, Frank-Lothar; Zenger, Erich (2011). Psalms 3: A Commentary on Psalms 101-150. Minneapolis: Fortress Press. pp. 293–294. ISBN 978-0800607623. ^ Mitchell, D.C. (2015). The Songs of Ascents: Psalms 120 to 134 in the Worship of Jerusalem's Temples. Newton Mearns: Campbell-Bright Morning Star. ISBN 978-1508745358. Retrieved 7 May 2015. ^ Goulder, Michael Douglas (1998). The Psalms of the Return (Book V. Psalms 107-150). Edinburgh: Bloomsbury T & T Clark. ISBN 978-1850758662. ^ Easton, M. G. (1897). "Easton's Bible Dictionary". T. Nelson and Sons. Retrieved 3 February 2015. ^ Crow, Loren D. (1996). The Songs of Ascents (Psalms 120-134): Their Place in Israelite History and Religion. Atlanta: Scholar's Press. pp. 26–27. ISBN 978-0788502194. ^ Gruber, Mayer I. (2007). Rashi's Commentary on Psalms. Philadelphia: Jewish Publication Society. p. 698. ISBN 978-0827608726. Retrieved 7 May 2015. ^ Scherman, Rabbi Nosson (2003). The Complete Artscroll Siddur (3rd ed.). Mesorah Publications, Ltd. p. 183. ISBN 9780899066509. ^ "Cantor Yossele Rosenblatt, Some Notes". Chazzanut Online. Retrieved 1 September 2018. 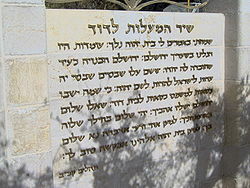 ^ "Why do people place the "Shir Hamaalot" Psalm near a baby's crib? - life cycle birth the laws". Askmoses.com. Retrieved 19 May 2018.